To understand the growth of income inequality—and the disappointing increases in workers’ wages and compensation as well as middle-class incomes—it is crucial to understand the divergence of pay and productivity. Productivity growth, which is the growth of the output of goods and services per hour worked, provides the basis for the growth of living standards. Productivity and compensation (wages and benefits) of the typical worker grew in tandem over the early postwar period until the 1970s. In contrast, over the last few decades, productivity has grown substantially, but the hourly compensation of the typical worker has grown much less, especially in the last 10 years or so. In fact, the gap between productivity and compensation growth for the typical worker has been larger since the early 2000s than at any point in the post–World War II period. As such, the last 10 years have been a “lost decade” for American workers. In this light, it is more accurate to say that productivity provides the potential for growing living standards because there is no guarantee that productivity gains will be widely shared. One key factor in the divergence between pay and productivity is the widespread erosion of collective bargaining that has diminished the wages of both union and nonunion workers. 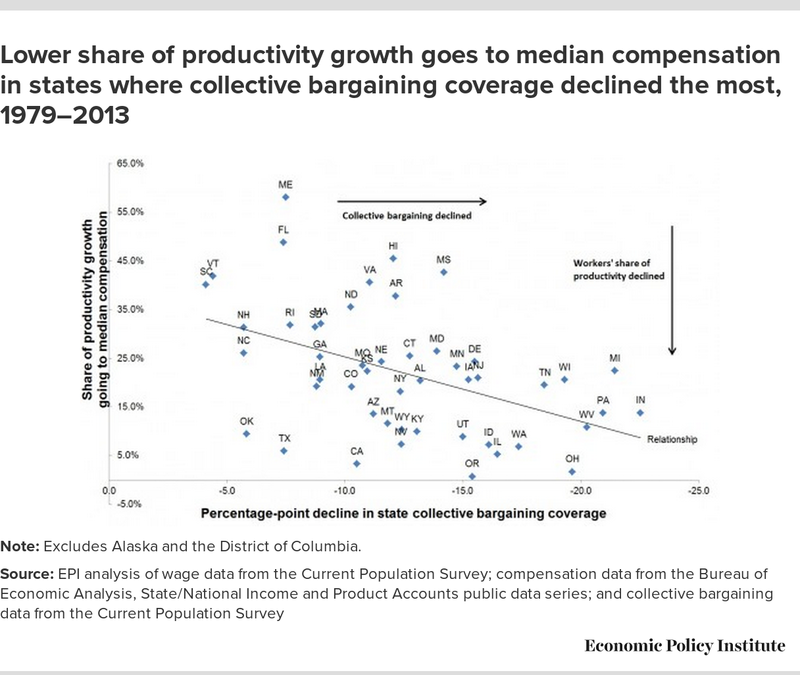 This will be demonstrated below by showing that the productivity–pay gap grew most in those states where collective bargaining coverage declined the most. 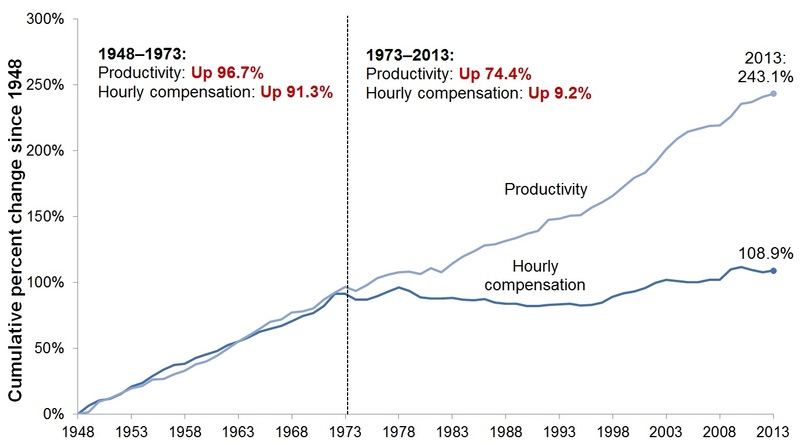 The hourly compensation of a typical worker grew in tandem with productivity from 1948 to 1973. That can be seen in Figure A, which presents both the cumulative growth in productivity per hour worked of the total economy (inclusive of the private sector, government, and nonprofit sector) since 1948, and the cumulative growth in inflation-adjusted hourly compensation for private-sector production/nonsupervisory workers (a group comprising over 80 percent of all workers). Note: Data are for compensation (wages and benefits) of production/non-supervisory workers in the private sector and net productivity of the total economy. "Net productivity" is the growth of output of goods and services less depreciation per hour worked. After 1973, productivity grew strongly, especially after 1995, while the typical worker’s compensation was relatively stagnant. 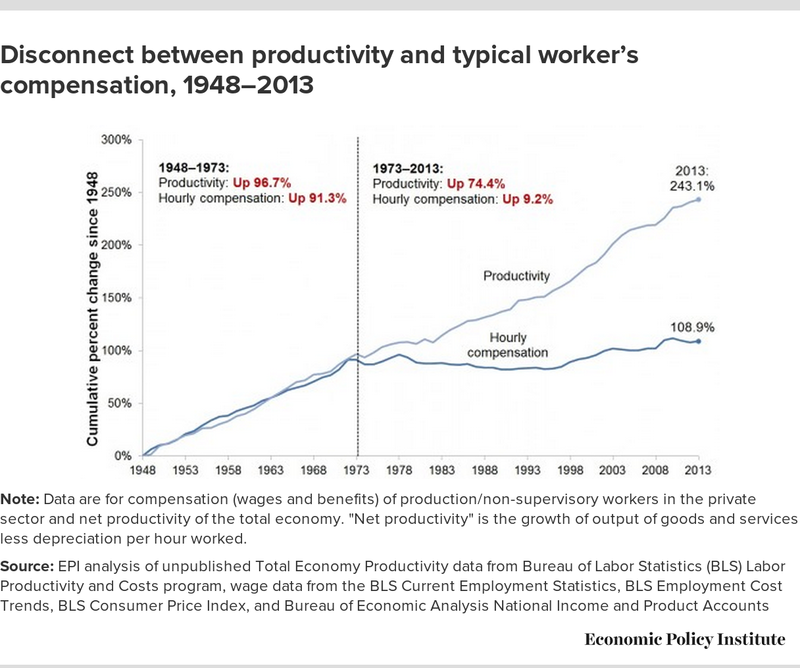 Specifically, productivity grew 74.4 percent since 1973, while the hourly compensation of a typical worker grew just 9.2 percent. This divergence between pay and productivity growth has meant that workers are not fully benefiting from productivity improvements. The economy—specifically, employers—can afford much higher pay, but is not providing it. This is because policy choices made on behalf of those with the most income, wealth, and power have suppressed wage growth for the vast majority. A key factor undermining pay growth for middle-wage workers over the last few decades has been the erosion of collective bargaining. When unions are able to set strong pay standards in particular occupations or industries through collective bargaining, the employers in those settings also raise the wages and benefits of nonunion workers toward the standards set through collective bargaining. Thus, the weakening of the collective bargaining system has had an adverse impact on the compensation of both union and nonunion workers. The erosion of collective bargaining has had a greater impact on men than on women, and on non–college educated workers than on college graduates—reflecting the groups who were more likely to be covered by a union contract in the late 1970s. 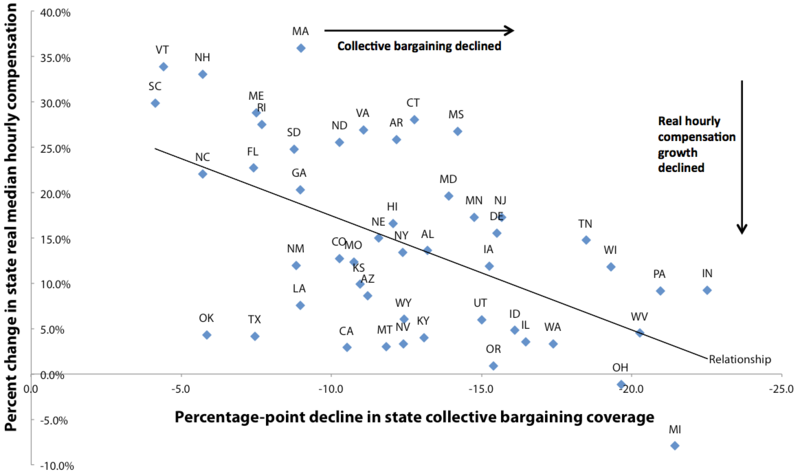 Figure B shows that inflation-adjusted median hourly compensation—a measure of the pay of a middle-wage worker—grew less in the states where collective bargaining coverage fell the most. Specifically, the 10 states that had the least erosion of collective bargaining saw their inflation-adjusted median hourly compensation grow by 23.1 percent from 1979 to 2012, far faster than the 5.2 percent growth of the 10 states suffering the largest erosion of collective bargaining—a gap of 17.9 percentage points in compensation growth. Note: Excludes Alaska and the District of Columbia. 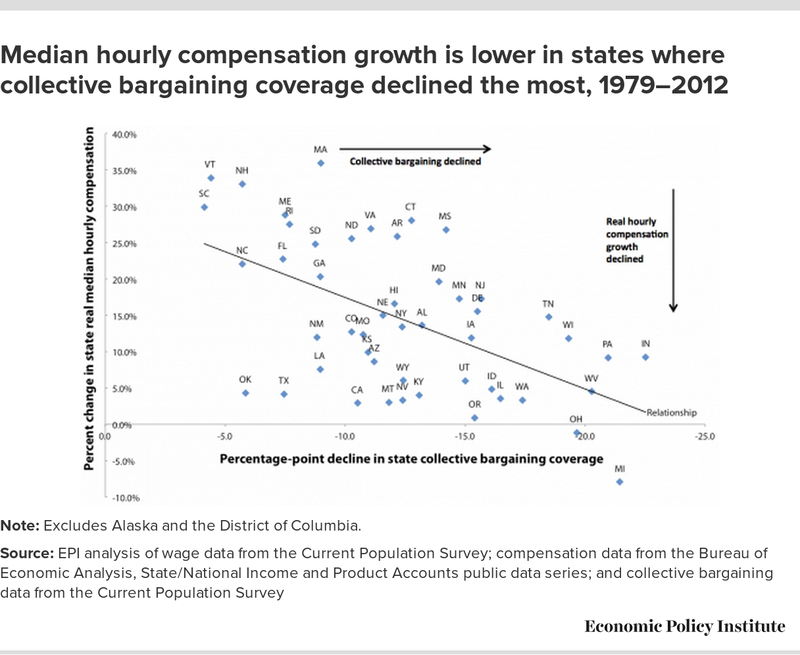 This same dynamic played out in the ability of the typical worker to share in productivity growth; the divergence between the growth of median hourly compensation and productivity was greater in the states that suffered the largest erosion of collective bargaining. 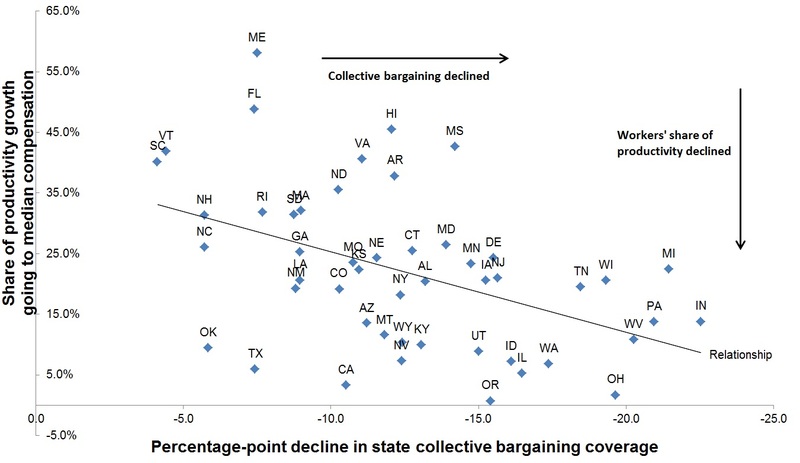 Figure C plots the share of productivity growth that went to the typical worker in each state against each state’s decline in the share of workers covered by collective bargaining. The greater the decline in collective bargaining coverage, the lower was the return on productivity obtained by the typical worker. Any effort to reestablish a link between pay and productivity growth will need to promote policies that enable workers to once again join unions and bargain collectively. This conclusion is central to any debate about how to address ongoing income inequality or limited income mobility. It is only once workers have the ability to bargain for higher wages that we will see the broad-based wage growth necessary to remedy these problems. State productivity is based on the Bureau of Economic Analysis’ (BEA) measure of each state’s gross state product and of nonagricultural employment. Each state’s productivity is adjusted to reflect differences in the national trends of total hours worked in the economy and nonagricultural employment. The result is a measure of productivity per hour worked. State median wages were calculated using the Outgoing Rotation Group files of the Current Population Survey. These are converted to measures of median compensation by multiplying by the ratio of compensation to wages for each state and year using BEA data. Mishel, Lawrence. 2012. Unions, Inequality, and Faltering Middle-Class Wages. Economic Policy Institute, Issue Brief #342. Mishel, Lawrence, and Matthew Walters. 2003. How Unions Help All Workers. Economic Policy Institute, Briefing Paper #143.